It’s with great excitement that I make the announcement today of a big change in the world of online swimming∗. ∗(Definition of Online Swimming: Reading online nonsense about swimming because you don’t have time for actual swimming in real life. Aka, writing online nonsense about swimming because you don’t have time for actual swimming in real life). 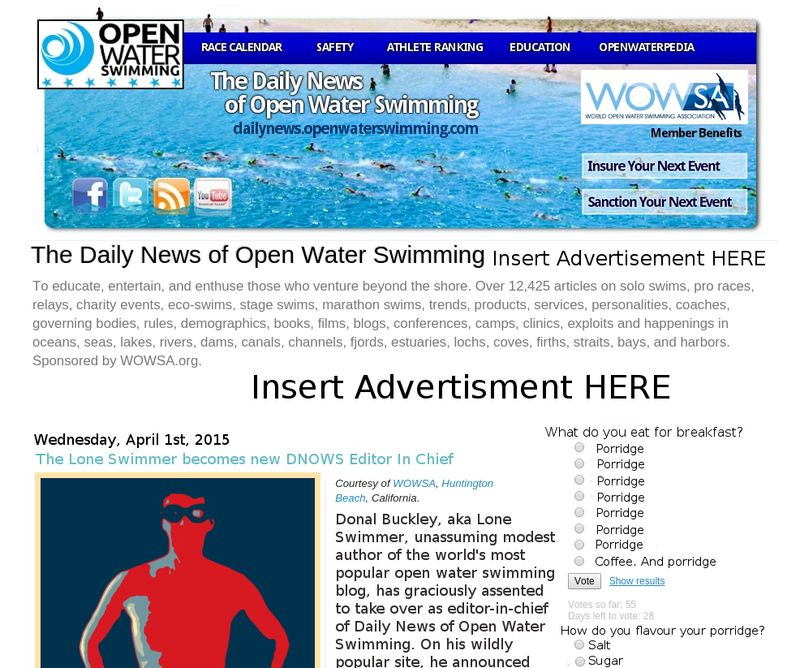 As of today I am taking over the position of Editor-of-Chief of Daily News of Open Water Swimming (DNOWS). See also Open Water Source’s simultaneous announcement on the DNOWS/OWSA Twitter feed and the DNOWS front page. Negotiations have been ongoing for some time after an informal group of well-known people involved in open water swimming approached me with a plan to reinvigorate DNOWS. I’d like to take this opportunity to thank Julie Bradshaw (Channel Swimming Association Secretary), Ram Barkai (International Ice Swimming Association) and Mortie Berger (NYCSwim) for coming together to spearhead the change, all of whom have been particularly positive vocal supporters of LoneSwimmer.com. You’ve probably got some questions. I’ve got answers. So first, what does this mean for Loneswimmer.com? How will I waste time at work each week from now on? 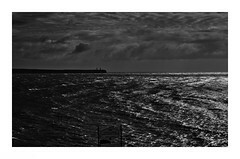 The world’s most popular open water swimming blog, Loneswimmer.com, will continue and I will use it to continue to pursue my personal (some say eclectic) vision of exploring the world of open water swimming while adding occasional Paddywhackery and “Oirishisms” that has seen me ostracised by my fellow country people, in pursuit of the mythical approval of foreigners, (like generations of Irish people before me). I will continue to freeze my arse off winter swimming and doing stupid things in the water at other times just for your amusement, entertainment and just occasionally, edification. Stories from here which have in the past inspired <cough> so many Daily News Of Open Water Swimming articles will continue. I’d like to thank previous DNOWS editor Steve Munatones for the smooth handover. Steve has always been the very biggest fan of Loneswimmer.com and the content from Loneswimmer.com and from the Marathon Swimmers Forum. As of right now, I’m first deleting content from DNOWS, prior to updating the site. What changes can we expect on DNOWS? Obviously, more ads. My current feeling about DNOWS is there just aren’t enough. A working search engine which will return search items instead of pages of unrelated and unwanted articles! Wahoo! DNOWS will work to support swimmers and open water swimming. Joining DNOWS previous and very laudable campaign which repeatedly called for warm water safety standards, DNOWS will now also campaign for cold water safety standards (rather than giving an unquestioning pass to relentless self-promoting cold water dippers). DNOWS will actively campaign to integrate the IMSHOF into the MSF umbrella organisation. Yes, I will beg Evan and myself for entry. More pools polls. Our new one asking what you had for breakfast promises to be particularly enlightening. Metric. No more of that Imperial measurement nonsense or American spelling. Colour, grey and honour etc will be correctly spelled from now on. What about the future of the WOWSA Awards? 2014 will have been the last year of the WOWSA Awards. In 2015 DNOWS will fully support the MSF Global Marathon Swimming Awards. We’re reworking Openwaterpedia. The evolution of the Marathon Swimmers Forum has demonstrated that open water swimmers care enough to act in concert for the good of the sport and we trust the community will work as a check for entries. Links on DNOWS will be formatted to connect to external links, not just to Openwaterpedia, but will (controversially) also link to actual websites. Will there be any further changes? Did I mention more ads? And pools Dammit. I mean polls! Speaking of ads, can I promote my new product on DNOWS? Doesn’t a new product automatically get you nominated for the WOWSA awards? I take it he is just making fun of this website? Oh no Iona, DNOWS doesn’t make fun of Lone Swimmer. It’s far too useful a source of, as I said, “inspiration”. I am however, making fun of DNOWS! Nice one Donal! This is great news and reminds me of The Myth of Wu Tao-tzu. You got me this time. Previously our taste in movies and books has been remarkably similar but this work I am unfamiliar with. I required a quick to understand the simile! So, Ellery, you checked the calender yesterday…?